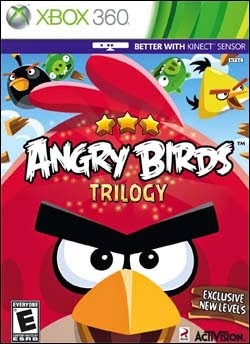 Notable Releases: Angry Birds, Angry Birds Star Wars, Angry Birds Go! Say what you will about casual games, the fact remains that they are here to stay. This is especially true when you look at the success of Angry Birds. What started as a simple physics-based puzzle game has quickly turned into a franchise spanning several game genres, toys, merchandise, and an upcoming feature-length animated movie. The series garnered a bit of notoriety recently, with the release of Angry Birds Go, a 3-D kart racing game, primarily for its misuse of the freemium (free-to-play) model and the inclusion of an energy system. But even that wasn't enough to completely mar what was essentially another great game. The latest installment is a turn-based RPG called Angry Birds Epic. Would you believe I've never played it? Wow. That's amazing, but perfectly understandable too. Angry birds! That's awesome. When you said video game series, it didn't even occur to me that you would pick Angry Birds. But I should have. Great game and great post! Looking forward to more! I never got into games that much, but I enjoyed your first post for A to Z.